Sandy Hook opened a rare opportunity to change not just a few laws but the basic terms of debate over public safety and social responsibility. Twenty-six names. It was the Republican State Senate minority leader, not a Democrat, who read out that list of Sandy Hook's dead children and teachers in the Connecticut State Capitol in April, in support of the state's sweeping new gun law. In the run-up to the vote, NRA members by the busload had flooded the Capitol's lawn and hallways. But by the time John McKinney—whose district includes Newtown—closed the debate with those names, legislators had also walked a quiet gantlet of Sandy Hook parents, who pressed letters and photos of their massacred children into politicians' hands. Connecticut's bill marks a vital achievement for the families of Sandy Hook Promise, formed after the killings, and for Governor Dannel Malloy. The bill—more comprehensive both in gun regulation and social policy than the background checks facing an uphill battle in Congress or the post-Newtown gun laws passed in New York, Colorado and Maryland—attempts, among other things, to close the multiple loopholes that permitted shooter Adam Lanza to assemble an armory, kill his mother—who had legally bought his arsenal—and invade Sandy Hook Elementary School. As Malloy said after signing the bill, "If we had the law that we signed today in effect, Mrs. Lanza would not have been able to purchase that gun. It would not have been in that home." And while the bill does not address the handguns responsible for most of the killing in Connecticut's cities—as Malloy pointed out, ninety-four of the state's 129 homicides in 2011 were in Bridgeport, Hartford and New Haven—it does go after the supply chain, toughening penalties for straw buyers and traffickers. Along with the new gun restrictions, the Connecticut bill also initiates large-scale reform of the state's mental health infrastructure. The question in Newtown—as in Aurora, Tucson and at Virginia Tech—is how an obviously deranged and dangerous person could slip through the cracks. Connecticut's new legislation envisions a grassroots safety net of teachers and first responders trained to recognize people at risk and steer them to help; gives police and other agencies marching orders on communicating with one another and keeping potentially dangerous people away from weapons; and requires insurance companies to give priority to mental health requests. Addressing such issues is as central to preventing massacres as the bill's gun provisions, and is just as important a piece of the social contract. The success of Connecticut's legislation also vindicates go-for-broke political leadership in the face of tragedy. That includes President Obama and first-term Governor Malloy, whose vigil with Sandy Hook's families last December transformed him from a pragmatic, sometimes technocratic progressive into a determined moral crusader, openly contemptuous of the NRA and its president, Wayne LaPierre (who, Malloy said, "reminds me of clowns at a circus. They get all the attention"). For months, legislators in both parties dragged their feet. Finally, in early April, Malloy and Connecticut's US senators, Richard Blumenthal and Chris Murphy, publicly shamed a General Assembly unaccustomed to serious scrutiny or quick action, warning of dire consequences for the gun debate nationally if the home state of the December 14 massacre could not act. In the end, Connecticut did act—even though no state has a longer partnership with the firearms industry, a history more potent than the NRA on its best day. Eli Whitney invented gun manufacturing at his mill near New Haven; in early April, legislators voted on the bill in sight of the blue onion dome of Samuel Colt's historic Hartford gun factory; and the Sandy Hook shooting unfolded in the town that headquarters the National Shooting Sports Foundation. For generations, the state's politicians, Democrat and Republican alike, nurtured an economy bound to armaments ranging from sidearms to nuclear submarines. Connecticut—it is the parents of Sandy Hook who have driven that transformation. For decades, fear of crime and "gun control" were the most reliable dog whistles in American politics. But now there's a chance that those old culture wars will be swept into irrelevance, thanks largely to the insistent witness of these parents. President Obama, for one, seems to understand that Sandy Hook opened a once-in-a-generation opportunity to change not just a few gun laws but the basic terms of debate over the meaning of public safety, social responsibility and national security. That was why, on April 8, he hosted Sandy Hook Promise families on Air Force One, flying them to Washington to confront Republicans threatening to filibuster the national background-checks bill. Some of Connecticut's Republican legislators seem to have read the same memo. If the state GOP caucus had opposed the gun bill, "we as a party would have been dismissed from relevance not just on that issue, but on any issue going forward," minority leader Larry Cafero observed. Far-seeing Republicans might even sense a chance for their party to escape its reliance not only on the NRA but on other far-right absolutists. When Senate minority leader McKinney read out those twenty-six names, he was honoring his constituents' memory. But McKinney was also speaking in particular to his own party, locked for decades in a partnership with the weapons lobby. 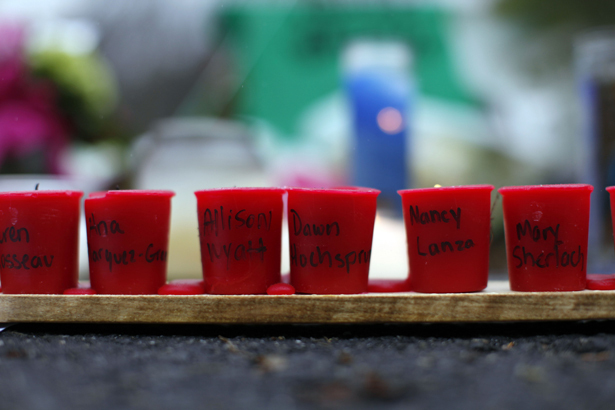 No one touched by the Sandy Hook killings is unchanged, but for Republicans of conscience, the moral crisis is acute. Bruce Shapiro, a Nation contributing editor, is executive director of the Dart Center for Journalism and Trauma (dartcenter.org).